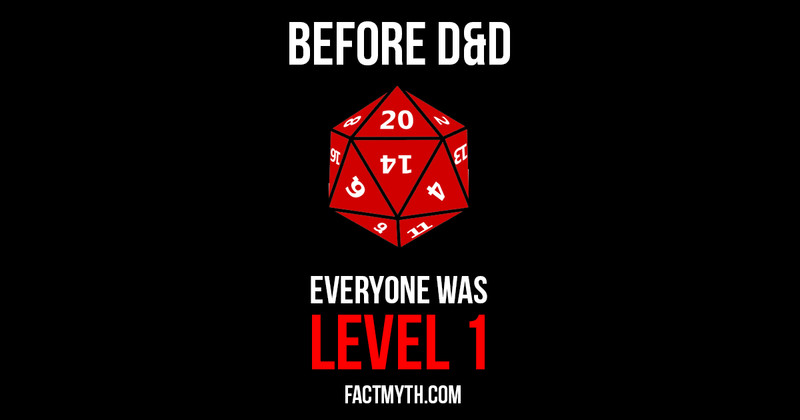 Dungeons and Dragons Was the First Game to Feature EXP and Leveling Up - Fact or Myth? Forget Savings Accounts, You Can Get a Better Return With Funds I Ching-ing Things; Or, Looking For Meaning in Mostly Random Events Analysis and Synthesis Explained Types of Conflict Theories A System of Categories of Being and Knowledge The Basics of a Theory of Knowledge Casually Explained: Evolution What is Identity Politics? Mises and Marx Missed the Mark, and So Did Mussolini What is Criminal Virtue? 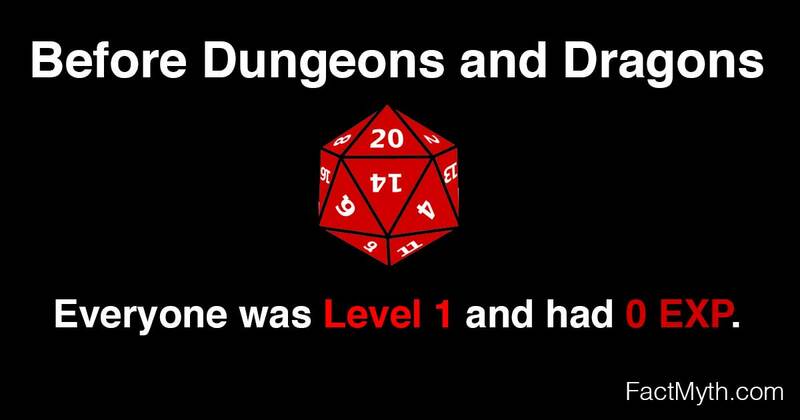 Dungeons and Dragons was the first game to feature "experience points" and "leveling up". David Arneson invented “the experience points system” and “leveling up” (common features in role playing games) while working on a precursor to Dungeons and Dragons called Blackmoor with Gary Gygax. Thus, Arneson’s Blackmoor, not “Gygax’s Dungeons and Dragons“, was the first game to feature “experience points” and “leveling up”. Blackmoor and its mechanics were inspired by Arneson’s wargaming sessions, and fiction like The Lord of the Rings and Dark Shadows. Later, Arneson officially began working on Blackmoor in 1971 – 1972. Meanwhile, Dungeons and Dragons (OD&D) was published in 1974. Then, in 1975, Arneson released a Blackmoor Dungeons and Dragons supplement (Supplement II Blackmoor), later he would release more Blackmoor products including a campaign setting. TIP: See one of the first ever level sheets below! A history of D&D, showing that EXP and leveling up originate with the Chainmail play sessions and make their way into Blackmoor before becoming popularized by D&D. According to lore, Arneson came up with the idea of “leveling up” while play-testing a game he co-created with Gygax called Chainmail (published in 1971). Chainmail never included experience points in its rule-set and Blackmoor’s product release is complex and generally comes after 1974, thus, the ideas Arneson had officially made their debut in the original Dungeons and Dragons rule-set in 1974. NOTE: Other inspirations include older war games where soldiers could increase in rank, and generally one can look to things like the boy scouts, military, and point systems to see other roots of these features (this is noted again below). Between Chainmail and D&D in 1974, Arneson worked on a miniature based fantasy war game called Blackmoor. Today we might consider Blackmoor as part of the D&D universe, but at the time, it was more like a separate game that Arneson played with his war gaming buddies in 1971 – 1972. 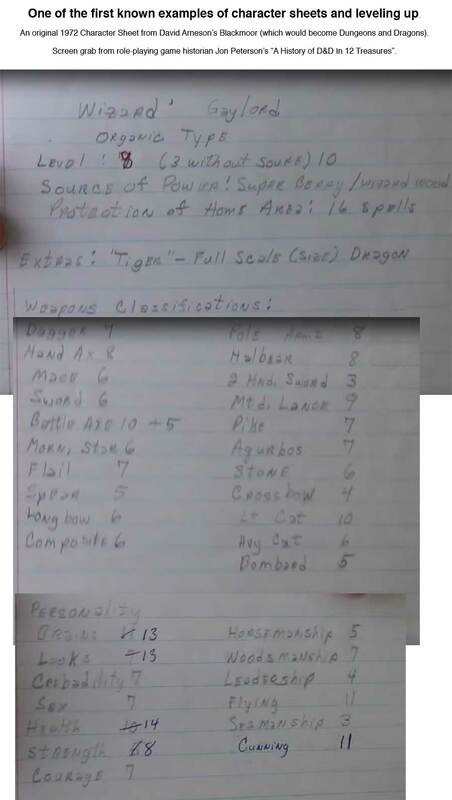 The character sheet from a 1972 Blackmoor game below shows other relatively innovative concepts like character sheets as we know them today, spells (which Gygax had taken from fantasy books), core stats like “brain” which would become “intelligence” and “wisdom“, and weapon specific stats that could get a “+” bonus notice the “+5” to the battle axe stat. An inspiring interview with Dave Arneson. Military ranks and Boy Scout ranks. In both, you do tasks to earn experience and can advance ranks based on your achievements. Point systems. Point systems were used in older games and video games. Generally, we can see point systems and ranking systems before Dungeons and Dragons, but the concept of leveling up a character based on experience points originated with Arneson. A full-length documentary on Dungeons and Dragons. Dungeons and Dragons was the first major game to feature experience points, leveling up, and other new game mechanics, but the less well-known Blackmoor came first (and Chainmail also tells part of the story). Anyway we phrase it, Arneson deserves the credit. Generally Gygax and Arneson are the fathers of Role Playing Games, and there wasn’t even much of a fantasy gaming scene before D&D. Gygax tends to get the bulk of the credit in retrospect, but EXP and leveling up were mostly the creation of co-creator Dave Arneson (see “multiple discovery“). “Who created the idea of Experience Points?“. Rpg.stackexchange.com. Retrieved Jan 16, 2016. “Experience point“.Wikipedia.rog. Retrieved Jan 16, 2016. “Dungeons & Dragons“.Wikipedia.rog. Retrieved Jan 16, 2016. “FORTY YEARS OF ADVENTURE“. Dnd.wizards.com. Retrieved Jan 16, 2016. “Blackmoor“.Wikipedia.rog. Retrieved Jan 16, 2016. “Chainmail (game)“. Wikipedia.rog. Retrieved Jan 16, 2016. Wow there’s so much here that’s inaccurate. Was this written by a high school kid? Arneson began Blackmoor games in 1971 – not ’72. The “rules” were not published in 1975. Arneson wrote a D&D supplement book called Supplement II Blackmoor that was published in 1975, but these are D&D rules, monsters and a setting for D&D. Supplement II has no rules to his original game. Yes, experience points and leveling up were both instituted by Arneson in his original Blackmoor game (you can read about details on my ‘blog Hidden in Shadows if you are inclined), but this happened a couple years before Arneson began to work with Gygax on D&D. Also, leveling up wasn’t entirely unfamiliar to Arneson and his group of wargamers because they already had wargames rules that allowed green troops to improve to elite troops in their wargame campaigns. I don’t know what “Blackmoor was part of the D&D universe” is supposed to mean. It sounds like retconning. You might just as well say D&D was part of the Blackmoor universe. Folks were playing Blackmoor 2 years before the first draft of D&D existed. Ha, well, I’ll skip commenting on the insult and move right on to thanking you (researching this was rather difficult and the article was an early effort on our part… that really did need an edit, good catch). The goal of the site is to get the facts right over time with the help of input from our readers. Glad to have the extra insight, I have to say our presentation of the facts wasn’t far off from what you say, but certainly you provided lots of helpful details that I will weave into the page. Thank you. Feel free to come back and drop a link to the page you are referencing. I’d be psyched to have more details and would be happy to cite your page.